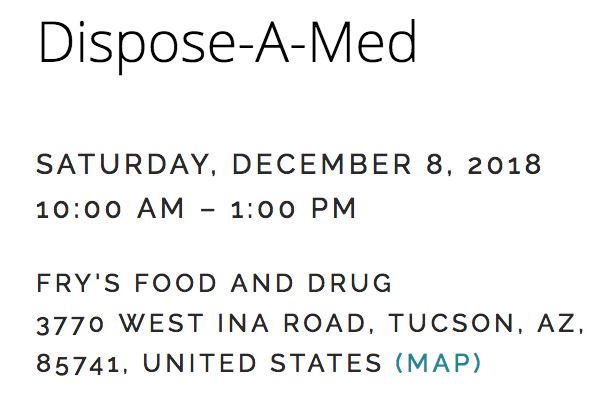 The Dispose-A-Med event that will be taking place Saturday, December 8 , 2018 at Fry's Food & Drug Store located at 7870 N. Silverbell Road, from 10am-Noon. The Marana Police Department, in partnership with the Marana-Foothills Optimist Club, Marana Prevention Alliance, and Vistoso Funeral Home, encourage citizens, businesses and schools to join us in sharing information about drug awareness and preventive measures. THE MARANA POLICE DEPARTMENT WOULD LIKE TO LET EVERYONE KNOW OF A CHANGE WHEN IT COMES TO THIS EVENT. SYRINGES, CREAMS OR LOTIONS WILL NO LONGER BE COLLECTED. SORRY FOR THE INCONVENIENCE.